India lock horns with West Indies in a long tour comprising of five ODIs, one T20 International match and three test matches. Lot of cricket ahead after CLT20 2014 was bagged by Dhoni led team CSK. Now he will face his team mates Bravo and Smith in the opposition. Catch every moment on Star Sports in India. 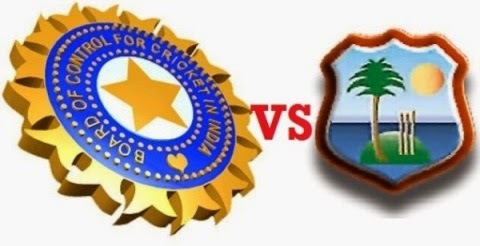 India vs West Indies live streaming online would be available on Star Sports official site. Also tune into Star Sports 1, Star Sports 3 and Star Sports HD for live TV telecast of all matches with live Hindi and English commentary. West Indies tour to India kicks off with an ODI series which could be considered as a great opportunity to prepare for ICC Cricket World Cup 2015. To know more about the full schedule please click here. India would enter the field with a full strength squad playing at home. West Indies anyhow have had a poor run against India back home and also in India. They must have had served some dreams of creating a few upsets but they are further handicapped with two blows. Chris Gayle is absent due to injury with very slim chances of he featuring in the test series. And now Sunil Narine is out of the squad with a looming fear of ban on his bowling. He has had a lot of fans worldwide for his intelligent and economical bowling. But recently he was reported twice for suspect action in CLT20 2014. India: Mahendra Singh Dhoni (C), Shikhar Dhawan, Ravindra Jadeja, Amit Mishra, Bhuvneshwar Kumar, Mohammed Shami, Mohit Sharma, Umesh Yadav, Murali Vijay, Kuldeep Yadav, Ajinkya Rahane, Virat Kohli, Suresh Raina, Ambati Rayudu. West Indies: Dwayne Bravo (C), Ravi Rampaul, Kemar Roach, Andre Russel, Darren Sammy, Marlon Samuels, Lendl Simmons, Dwayne Smith, Darren Bravo, Jason Holder, Leon Johnson, Kieron Pollard, Denesh Ramdin, Jerome Taylor.